Napping on a plane (or bus or train...) can be nearly impossible, especially in the middle seat. The Trtl Pillow gives you soft-but-strong support so you can rest in a comfortable position no matter where you’re sitting. 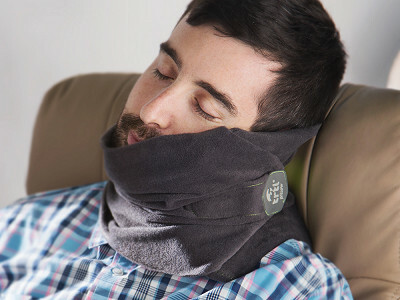 Trtl is a lightweight nap scarf with flexible internal ribs that support your head from the side or under your chin. The natural, ergonomic position lets you rest easy, and you won’t wake up with a stiff neck. When we tried it here at the office, it was even better than having a wall (or someone else’s shoulder) to lean on. Pull the fleece up over your mouth to keep cozy and, if you drool, it’s covered. The pillow is easy to travel with and it’s washable, too. Co-founders Michael Corrigan and David Kellock met in college for mechanical engineering. Their shared love of travel and adventure inspired them to reinvent the travel pillow. 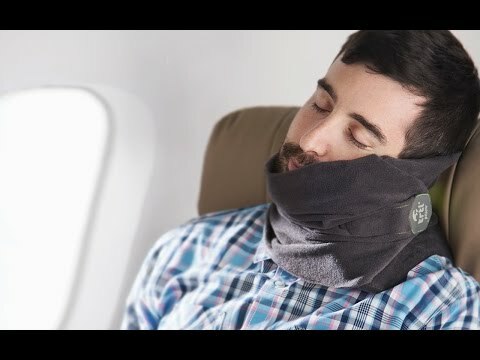 Their ingenious solution makes traveling more comfy and far less tiring. Hello everyone! I'm proud to introduce the Trtl pillow to The Grommet. I'd be happy to answer any questions you have! This invention looks like a perfect solution to an age old problem. I'm definitely purchasing this one. I'm lovin' Grommet's products; Christmas list almost ncomplete. How does the scarf feel on your neck? Will it make you sweat or make you feel so hot that you want to take it off mid-flight? We are travelling the week of Thanksgiving. Will these be available before then? @Betsy They are available now - just a little glitch!! @Marcia Hi Marcia: I, too, am interested in purchasing for Thanksgiving holiday travel. What's the "little glitch?" It is no more! There was a brief moment where it said Trtl wasn't available on site, but it is! You can get it for your Turkey Day travels no problem! How tight do you have to wrap the scarf around your neck? wondering if the Trtl could be effective lying down. I have neck arthritis and continually struggle to find a good way to relax my neck while sleeping on my back. Would this keep a good ergonomic placement of the head or not have any effect? @Lisa Thanks for your question. The Trtl Pillow is recommended to be used for when you are in an upright position, although it does still support your head when you are lying down but as mentioned it is more beneficial to you when you are wearing it when you are in an upright position. If you have more questions please just ask, I'm here to help! would this fit my 4 year old? when she sleeps in the car on long rides, she wakes up with a stiff neck! @Nicholas Hello! Thanks for your question. The Trtl Pillow unfortunately recommended age is 14 years old plus. According to the listed dimensions it's 7.5"x7.5"x3.7". It looks much larger than that in the photos. How big is it? Hi Vivien Sandra, those are the dimensions when wrapped around your neck. Unfurled it is 27" x 10" by 3.7". Hi @Leslie the Trtl Pillow does not need a headrest for the product to work, it works best when you are sitting in an upright position so it would be more than suitable for your son as he can rest using the Trtl pillow to the front, right or left side to have a comfortable nap. If you have more questions please just ask, Mike and I are here to help! Hi @Bruce apologies for the sound quality of the video interview - we have a noisy office being based in central Glasgow so unfortunately this may have interfered a little when we were filming. The Trtl Pillow is a very compact and flexible product which makes it easier to pack than standard u-shaped travel pillow out there just now. It can also be attached to your luggage handle/ carry on for ease of carrying. If you have more question please just ask I am more than happy to answer your queries! :) Thanks. Do I have to remove the plastic part to wash? Can I use washer/dryer for cleaning the scarf? My husband could have used this for the 6 long weeks he had to sleep in a chair. He had to wear an arm sling with a bulky supportive arm rest to keep his shoulder from slouching down. This prevented him from being able to sleep flat on a bed. 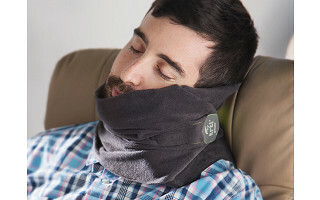 When I showed this to him he said that everyone that has shoulder surgery and/or has to sleep in an upright position has to have this neck support travel pillow!! We think that Michael and David have a winner with this one!!!!!! @Cara You are very welcome. Cara. My husband Steve has many therapy sessions to go through before he will have full use of his right arm and shoulder. He had reconstructive surgery on his right shoulder rotator cuff. But the worse part is over, and his doctor said his shoulder is healing very nicely. If he has to have a second shoulder reconstructive surgery done on the same shoulder or on his left shoulder he will most definitely want me to order one of these for him prior to the surgery. Thanks again for launching the Trtl Pillow!! You have an amazing product that could really make a difference. With that said you only have a few seconds to say what is important before you lose your audience. So please rethink the video. Allow others to talk about weight, comfort and age requirements. Bring in things like ease of operation with ear phones and the dreaded head jerk which ends up giving you a stiff neck. This might be a good product but you need to polish the presentation. Thank you for bringing it on the scene. I am curious but not yet a buyer and I do travel quite a bit. Hi there @Bill thank you for commenting - we are happy that you feel Trtl Pillow could make a difference as we created the product as a solution to a well known problem of not being able to sleep on the go comfortably and this product eliminates this issue! The product can be used with other travel products such as earphones, eye masks etc which is a great factor to note. If you travel often I would definitely give the Trtl Pillow a go as we have had fantastic feedback from our customers so far so I believe you could also enjoy the benefits too! :) If you have more questions then please just ask! Great timing! I flew Wednesday in the window seat of the first exit row of the two middle-of-the-plane exit rows...so the seats don't recline at all (because of the exit row behind). For 3 hours my head was either sliding down the window as I fell asleep or my head was dropping to my chest and waking me as soon as I fell asleep, because I couldn't recline and get an angle. Just two days ago! Anyhoo, that leads to my question: if I'm sitting upright (as in an airplane seat, for example), will this device keep my head from dropping forward to my chest as I fall asleep? Hello- Looks great but can it be packed flat? Thanks. How will it work with large over the ear noise-cancelling headphones? I will be having shoulder surgery and need to sleep upright, so am wondering if I could use the Trtl. Since it rests on your shoulder would that be counter productive? How close to your neck does the brace sit? Hi there @Jo :) The Trtl Pillow's internal support should be tucked just under your chin/side of neck and the weight of your head rests on the internal support which is placed on your shoulder to create the support overall. I would recommend trying the Trtl Pillow and would say it may be better to use the pillow on the shoulder that you will not be having surgery on. You can use the velcro to adjust the scarf which will make the scarf either closer/further away to your neck. I hope my answer has helped if you have more questions please just ask I am here to help! Hello Cara, the examples n the video seemed to all be with the head to one side, but no examples of it in the front, unless I missed something. I was wondering about the comfort in that position and whether or not it triggers a gag reflex. Also are you coming out with a later model where you don't have to choose only one side of support, but all 3 sides are supported? Hi @snype Thanks for commenting! It can be worn to the front but we only have examples of it being worn to the side currently as it is the best way visually to help the understanding of how the product works. If the Trtl Pillow is worn to the front it is best to be fastened not too tightly as you have mentioned it would put pressure on the front of the neck but it is just as comfortable wearing it to the front as it is to either side (and a great position for wearing if you are wanting to watch a movie in the process of nodding off!). @snype No problem. If you have any other questions please just ask! What is it made from? I see it is washable but I am interested in the material because I am allergic to wool and I'm not too excited about all the GMO cotton. Sounds lik e a great idea, but I've tried other supports that failed. Is it returnable if it doesn't work? Hi there @Ann I would say it would be worth trying it out as you never know it may be the right product for you after trying many others in the past :) It is returnable I will ad in the link for The Grommets returns process here. Thanks! Is there a possibility of suffocation? Sasquatch! You're back! Thanks for the question. Any time you put something around your neck you want to be careful. If you have trouble breathing for even a second, you should absolutely take it off immediately. But one of the many great things about Trtl is it does not require a tight fit. It very gently keeps you warm. It has a long velcro strip, too, which helps in keeping it loose but intact. Hope this helps! P.S. Did you end up going for FitKicks? If so, how'd it go? Hey Judie, your head may fall forward, but the good news is, your neck will remain upright thanks to the built-in support system. My question to you: do people sing "Hey Judie" like "Hey Jude" by The Beatles whenever the address you? Because I did that as I typed it. I have arthritis in my neck and could use some help with support when I am driving. Would this work for that? Hi Susan, if you need something that will keep your neck upright and comfortable, this should work just fine. When you get it, I would just be sure it doesn't affect your ability to look over your shoulder for oncoming traffic. Let us know! It could be another great use case. You say this is hypoallergenic fleece. "Fleece". Unfortunately that tells me little about the content of the fabric, since fleece doesn't nearly always originate on animals anymore. What is the content of the fabric? Hi Gwen, it is a lightweight, hypoallergenic, polyester fleece. Hope this helps! Napping on a plane (or bus or train...) can be nearly impossible, especially in the middle seat. The Trtl Pillow gives you soft-but-strong support so you can rest in a comfortable position no matter where you’re sitting. Trtl is a lightweight nap scarf with flexible internal ribs that support your head from the side or under your chin. The natural, ergonomic position lets you rest easy, and you won’t wake up with a stiff neck. When we tried it here at the office, it was even better than having a wall (or someone else’s shoulder) to lean on. Pull the fleece up over your mouth to keep cozy and, if you drool, it’s covered. The pillow is easy to travel with and it’s washable, too. 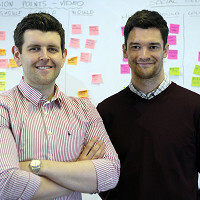 Co-founders Michael Corrigan and David Kellock met in college for mechanical engineering. Their shared love of travel and adventure inspired them to reinvent the travel pillow.